We have an exciting news to share with you on the auspicious occasion of Independence Day (i.e. 14th August), that Virtual University of Pakistan is going to launch VULMS Mobile Android App for its students. This application has been designed and developed by IT department of the University and formally will be available on Google Play Store from the start of new semester (i.e. Fall 2017). 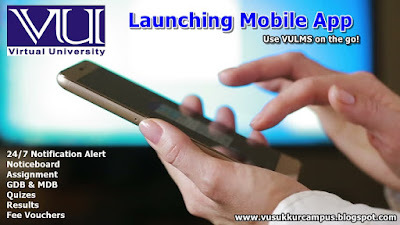 VULMS Mobile App developed to facilitate the students, to receive push notifications, fee alerts, course announcements, videos and discussions. This App will enable the students to remain updated and synchronized with their day to day learning and academic activities with ease and mobility. Can we download VU Apps which are shared in Facebook groups and Pages? No! do not download the Apps which are shared in fb groups or pages those apps are maid by third party means by VU students or by some other individuals which means those apps are not by VU officials and VU will not be responsible for any (Hacking or data misuse) happens after installing those apps. Are those third party VU Apps secure? We recommend you not to install those third party VU Apps and wait for the official release. Because of security issues. If you download those third party apps the creator of those apps can mine hacking attack for your smartphone which will run in background and take all data for example (phone logs, messages, media files, passwords, can take pictures from your phone) and send all these to the creator of this app and i am sure that you don't want all this to happen with you. Stay safe don't download! When the official app will be released? You can get the official app in play store watch the video below carefully to download VU Official App. Note: The VU App is up and running download it from Google Play store for Android.